PARO is a Mental Commitment Robot. They are designed to interact with humans and encourage formation of emotional bonds between human and virtual pet. Their purpose is to provide psychological effects (like relaxation and motivation), physiological effects (like improvements in the human’s vital signs), and social effects (like encouraging communication between patients and caregivers in nursing homes). PARO is a baby Harp seal, like those from north eastern Canada. Seals were chosen as a model instead of cats or dogs because people are very familiar with the movements and behaviors of cats and dogs. After a little while with a robotic cat or dog, they tire of it because they can tell it does not replicate real life. By using a seal, an animal most people know of, but have little experience with, the minor imperfections in modeling the animal are overlooked. This leads to a higher probability of forming a relationship with PARO. In addition PARO can go where other pets cannot go. Many nursing homes do not allow “real” pets but do allow PARO. PARO is an autonomous robot that can express surprise and happiness. It detects light, touch, temperature, posture and presence. PARO can also detect words, the direction they came from, and can be trained. 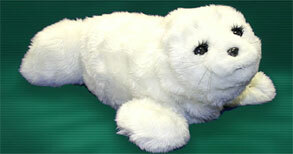 He makes noises like a real baby seal and his fur is antibacterial and soil resistant. PARO’s insides have an electromagnetic shield allowing people with pacemakers to use the robotic pet. Dr. Tankanori Shibata invented PARO. The term PARO comes from Personal Robot. PARO is about 57 cm long and weighs 2.7 kg. It uses a 32 bit RICS chip and can run about 1.5 hours on a full battery charge. You can learn more information about PARO from his web site.